Masada (Hebrew for fortress) is a place of gaunt and majestic beauty that has become one of the Jewish people's greatestsymbols as the place where the last Jewish stronghold against Roman invasion stood. Next to Jerusalem, it is the most popular destination of tourists visiting Israel. Masada was declared a UNESCO World Heritage site in 2001. "Since we long ago resolved never to be servants to the Romans, nor to any other than to God Himself, Who alone is the true and just Lord of mankind, the time is now come that obliges us to make that resolution true in practice ...We were the very first that revolted, and we are the last to fight against them; and I cannot but esteem it as a favor that God has granted us, that it is still in our power to die bravely, and in a state of freedom." 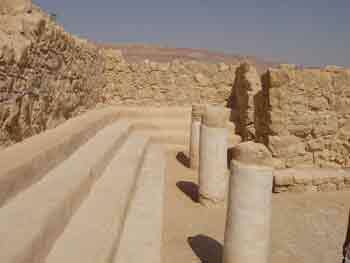 The story of Masada survived in the writings of Josephus but not many Jews read his works and for well over fifteen hundred years it was a more or less forgotten episode in Jewish history. Then, in the 1920's, Hebrew writer Isaac Lamdan wrote "Masada," a poetic history of the anguished Jewish fight against a world full of enemies. According to Professor David Roskies, Lamdan's poem, "later inspired the uprising in the Warsaw Ghetto." 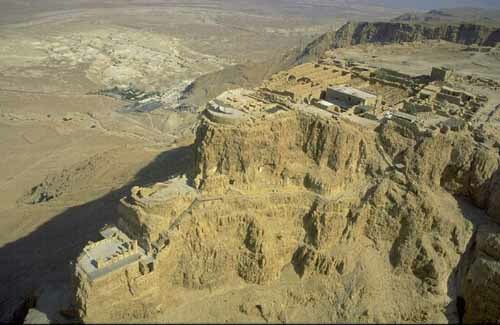 The heroic story of Masada and its dramatic end attracted many explorers to the Judean desert in attempts to locate the remains of the fortress. The site was identified in 1842, but intensive excavations took place only in the mid-1960's with the help of hundreds of enthusiastic volunteers from Israel and from many foreign countries. This consisted of two rows of long halls opening onto a central corridor. 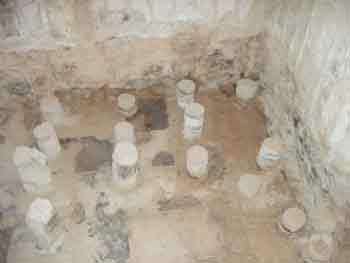 The floor of the storerooms was covered with thick plaster and the roofing consisted of wooden beams covered with hard plaster. Here, large numbers of broken storage jars which once contained large quantities of oil, wine, grains and other foodstuffs were found. An ostracon bearing the inscription me'aser kohen (tithe for the priest) was found in the synagogue. Also, fragments of two scrolls, parts of Deuteronomy and Ezekiel 37 (including the vision of the "dry bones"), were found hidden in pits dug under the floor of a small room built inside the synagogue. In the area in front of the northern palace, eleven small ostraca were uncovered, each bearing a single name. One reads "ben Yai’r" and could be short for Eleazar ben Ya’ir, the commander of the fortress. It has been suggested that the other ten names are those of the men chosen by lot to kill the others and then themselves, as recounted by Josephus. Evidence of a great conflagration were found everywhere. The fire was pobably set by the last of the zealots before they committed suicide. Josephus Flavius writes that everything was burnt except the stores – to let the Romans know that it was not hunger that led the defenders to suicide. Masada photo courtesy of the Israeli Ministry of Tourism. All rights reserved to Itamar Greenberg and to the Ministry of Tourism.